The first commercially available circuit breaker boxes made for the RE industry came in around 1989 from Photron. These boxes use paralelled breakers for added current capacity on the inverter curcuit. The boxes were not UL listed but were much better than nothing. Lawrence boxes used paralleled breakers for added current capacity on the inverter circuit. The boxes were not UL listed but were much better than nothing. Lawrence Jennings was a real pioneer in those early days. Our industry was called Alternative Energy back then. A little later, Ananda Power came on the scene with a fully listed AC / DC box. The breaker boxes were usually custom built for each installation though. They had standard versions, but since each installation was different, they advocated custom fitting features to the installation. They had standard versions, but since each installation was different, they advocated custom fitting the features to the installation. 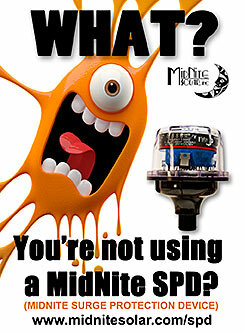 This made it almost impossible for distributors to stock the right product. The Ananda engineers built flexibility into each power center; such systems were quite complicated. They did not allow customizing in the field to any degree, so things had to be planned in advance by the installer and distributor. The retail price of this custom solution ran $1000 or more. The Ananda Power System quickly became the industry standard due to its UL listing and lack of competition. Now customers could actually get their renewable energy system inspected to NEC compliance. Ananda Power Center with a Trace SW and conduit box. During the early 1990’s when Ananda was gaining in popularity, I was very busy at Trace Engineering doing the mechanical engineering on the SW and DR inverters. 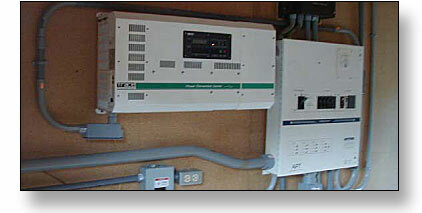 The industry standard inverter at the time was the Trace U series. I never made the U series able to accept battery cable conduit because I had little knowledge of the NEC. As it turns out, the industry was just learning about the NEC. Remember, the inverter industry was fueled by marijuana growers in Northern California and they didn’t have much use for inspectors. The Trace DR and SW series inverters were the first in the industry to have this NEC compliance addressed by virtue of conduit boxes among other mechanical design aspects. Ananda boxes concentrated heavily on DC load circuits. I figured that if you had a modern, efficient and reliable inverter, why would you need so many DC circuits? That notion was somewhat naïve on my part since I had actually never yet seen a real off-grid installation. Another aspect of the Ananda box was its high cost. It used a nice class T pull-out fuse for inverter current protection and breakers for all other circuits. The high cost, I figured, was due to the custom nature of this product as well as low quantities that have always plagued our industry. It seemed that there should be a code compliant solution to address the inverter battery over-current protection and disconnect that was affordable. None existed, so I began designing the Trace DC250, (1994 or 95).